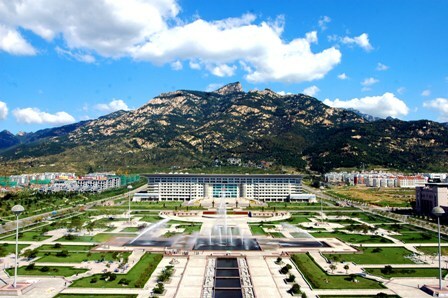 Tai'an is located at the southern foot of Mount Tai (35°38’～36°28’N and 116°20’～117°59’E). It borders Jinan, the capital of Shandong province in the north; Qufu, the birthplace of Confucius in the south; Zibo, Laiwu and Linyi three cities of Shandong, and Yellow River in the west. Tai’an administers two districts (Taishan district and Daiyue district), two county-level cities (Xintai city and Feicheng city) and two counties (Ningyang county and Dongping county), covering an area of 7,762 square kilometers with a population of 5.386 million people. Situated in the continental half-moist monsoon climate district of the Temperate Zone, Tai'an enjoys a pleasant climate with an annual average temperature of 13℃ (26.4℃ in July and -2.6℃ in January) and an annual average precipitation of 697mm. The altitude of Mount Tai within the jurisdiction of Tai'an is 1,545 meters; hence the area is also characteristic of mountain climate. The temperature on the top of the mountain is permanently 7～8℃ lower than at the foot. The annual average precipitation on Mount Tai is 1106mm. Tai'an is the place of origin for Chinese civilization. The existence and development of human beings dates back to more than 500,000 years ago. People in Xintai have entered into the stage of Homo sapiens 50,000 years ago. The brilliant Dawenkou Culture germinating in this area 5000 years ago is a significant landmark in the history of Chinese civilization.